Bernie and Mikey are perched on the edge of adulthood—a sister and brother trapped between the lives they crave and the circumstances they were born into. The children of a working class Italian family in 1990s Chicago, Mikey is torn between unrealized potential and loyalty to his sister, while Bernie, living with a cognitive disability, longs to find her voice but faces a world unwilling to listen. 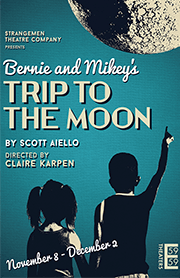 The world premiere debut of actor-turned-playwright Scott Aiello, Bernie and Mikey's Trip to the Moon is a heart-wrenching comedy about one family's coming of age, as they reckon with what they're willing to sacrifice to protect one another—and what they won't.